So I received this game in the mail with an offer to review and jumped at the chance. 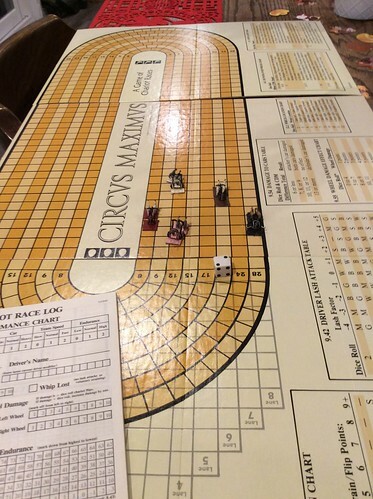 I love Chariot Racing games and always have thought that anything since Avalon Hill’s venerable (oh, so venerable!) Circvs Maximvs kind of suffers from not being the firstest with the mostest (as in, what? 1979?80?). The problem with classics from the bad old days is that they can heavily influence the design of any other game on the same subject that comes out later (see: Circvs Minimvs). I’m not a huge fan of maintaining a race log (which was all the rage back then) or checking a bazillion densely printed charts to figure out what.. exactly.. happened in that last turn. Bottom line up front– there’s a lot that can be done with the subject of chariot racing, both in and out of a historical model. and look splendid, if not amazing, in terms of counter and map art. I mean, they look like chariot standups, and a bunch of status markers.. and the track looks kind of like Circvs Maximvs. I think that’s because there’s only so many ways to make a historical chariot race track.. 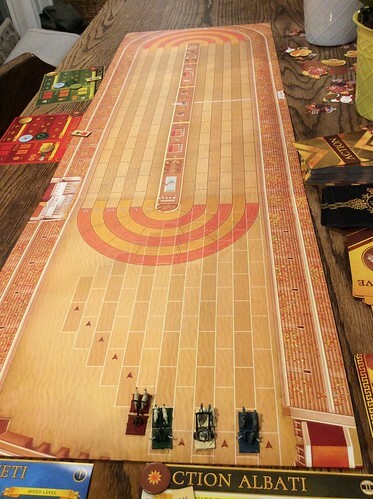 Yes, it looks like Avalon Hill/Battleline/many other chariot game racing maps. The thing is, this is what they looked like. There are fewer spaces on this one than the AH/Battleline game, and thus the races go a LOT faster. 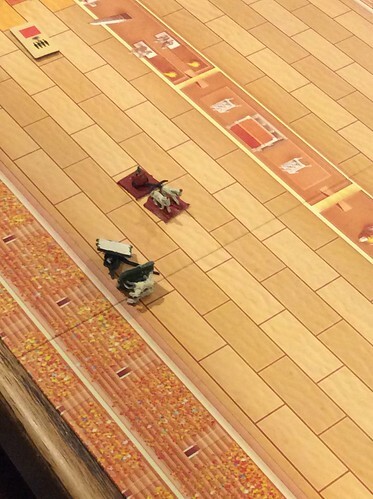 A chariot standup, a chariot placement marker (to help figure out where actions take place in a turn), backed by chariot wreckage.. Start tokens, Speed tokens, Lap Tokens, Endurance (blue), Tactics (green) and “Rattled” (red/brown). Think of the last as “Control” or “Stress”. FATE cards are a neat trick that the current race leader can pull every turn after turn 4. The race leader rolls a specially marked dice marked with sigils of the Gods. 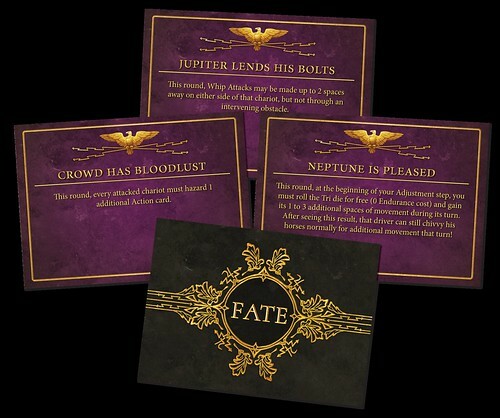 If Jupiter’s lightning bolt shows up, he draws a fate card. Fate cards can affect all, or one, racer for the duration of a turn. This is different from most chariot games I’ve played. The chariot status cards are a big change from recording everything on a log sheet. Everything you need to know about a chariot is here– Endurance, “Rattled” state, speed track and what that does for you, and tactics track. The components are an integral part of this design. Instead of maintaining chariot status on log sheet, the racer uses slider bars with tokens, which go up and down as the chariot’s fate unfolds in a race. Up AND Down? That’s correct, there are actions you can take to bump up your tokens in various categories. For instance, you can gain a tactics rating by the order you enter a curve. Or, you can regain “rattledness” and Endurance, plus one tactics token, if you start the turn by switching to a slower speed. This can lead to admittedly gamey situations– slowing up one turn, speeding up the next, but it all balances out– you usually have to sprint to the finish so it’s important to keep your chariot in one piece for the duration. Fast and elegant, if you want my opinion. 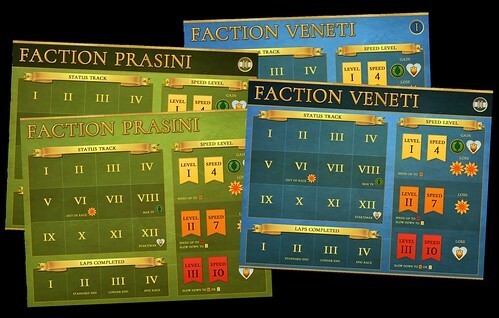 Initiative and activation is managed by drawing color cards for the racing teams (the historical Red, Green, Blue and White teams). I’ve played five games now and each one was a little faster than before, as we got used to the mechanics. 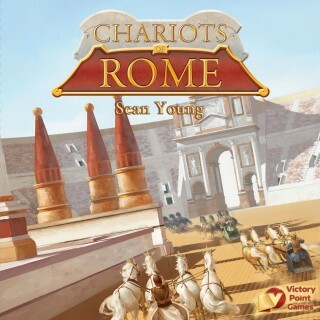 The most similar chariot racing game I can think of (one that also uses multi-use cards and special dice) is Matt Leacock’s recently Kickstarted Chariot Racing game, which is far more “compact” than this game. Race start. I use 6mm chariot teams instead of the counter, and I recommend you do, too. Much better visuals. 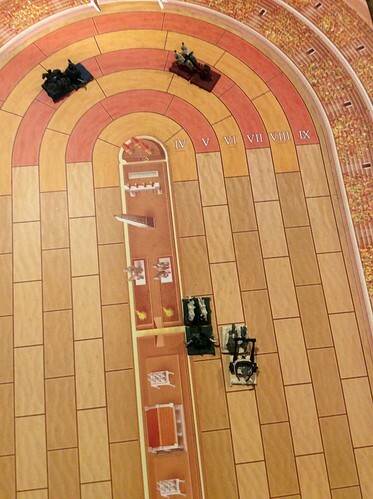 In this race, blue has probably entered the turn going at speed 7 (the middle speed– the game has three: 4, 7, and 10, plus any extra you get from chivvying your horses– as much as 3 extra spaces. Red has followed him but was a little rattled (for 2) and thus has to draw two ACTION CARDS and checking the “Cornering” line to see what messed up things will happen to him. White and Green are playing it safe at speed band 1 (for four) and are going slow enough to manage the INSIDE lane. Death comes to us all, sooner or later. My first reactions to the game system was “What? They let you GAIN BACK points? A race will take forever before a chariot gets knocked out!” Not so fast. If you manage to RAM a chariot into a wall (as Red has managed, here) it instantly crashes. Sure, there’s a way to regain lost points, but if a lot of bad things are happening to your chariot all in one turn, chances are he’ll be crashing before he can recover all the way, as Green does here. We did put a Youtube video of the game here, which sums up things nicely and provides some moving pictures. Chariots of Rome pulls a lot of familiar mechanics together (the track, initiative pulls, etc.) and mixes it with some brand new mechanics like Fate Cards, Charioteer characters and the Action Card draw. Everything new that was added was designed to make the game play just like a familiar chariot racing game, yet play in half the time as good old Circvs Maximvs. Remember me? I was your daddy’s chariot racing game! I think Chariots of Rome delivers on this premise elegantly. The initiative draws are fast, the speed bands work perfectly and the game is able to build the tension that it requires to call itself a chariot game. What would I do differently? Probably publish an expansion or two adding in other colored racing teams (AH had Pink, Orange and Yellow teams, why not this game?). I’d also consider adding fantasy chariots and downright designed for combat chariots like the giant multi-man Assyrian beasts.. the designer would just have to figure out rules for missile weapons. There’s nothing I’d change about the mechanics themselves. PS: All the pictures for this review are here on Flickr (I took a lot more than you see here).